The hand is composed of 19 bones (5 metacarpals and 14 phalanges), more than 30 tendinous insertions and numerous complex structures. The metacarpals are long, thin bones which are located between the carpal bones in the wrist and the phalanges in the digits. There are three palmar and four dorsal interossei muscles that arise from metacarpal shafts. We can also find the insertion of extensor carpi radialis longus and brevis at the base of the second and third metacarpal. This muscles assist with wrist extension and radial flexion. 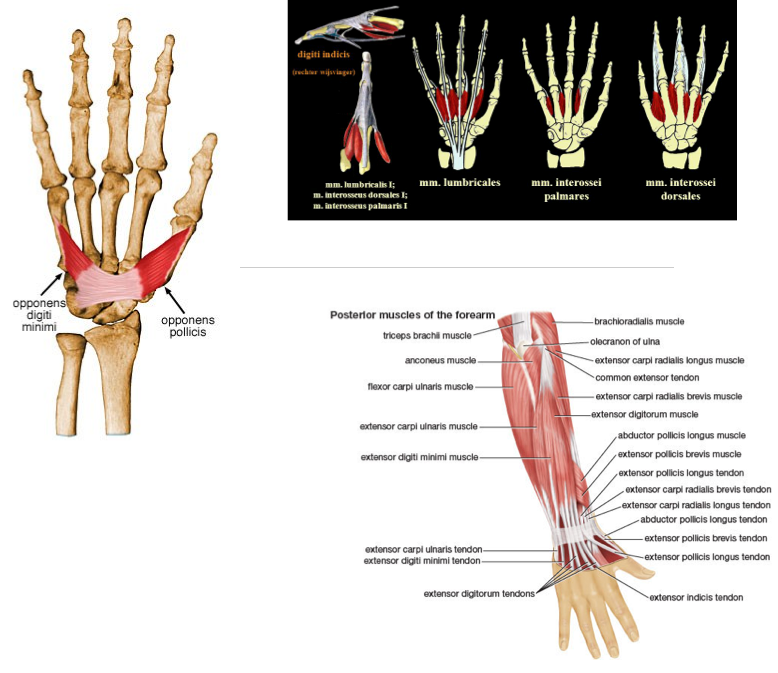 In the wrist we can thereby also find the extensor carpi ulnaris muscle, which inserts on the base of metacarpal five. His function is to extend and fixe the wrist when the digits are being flexed and assists with ulnar flexion of wrist. The abductor pollicis longus is situated in the area of the thumb. It inserts on the trapezium and base of metacarpal I and is responsible for abduction of the thumb in the frontal plane and extends the thumb at the carpometacarpal joint. At this site we can also find the opponens pollicis, which inserts on metacarpal I and functions as a flexor of metacarpal I to oppose the thumb to the fingertips. The final muscle at this site is the opponens digiti minimi, it inserts on the medial surface of metacarpal V, flexes metacarpal V at carpometacarpal joint. - Deformity. Knuckle asymmetry may be observed, and the knuckle may appear to be missing. - Finger misalignment may also be noted. - A metacarpal head fracture is associated with axial compression of the extended digit which causes severe discomfort. - In a metacarpal base fracture, movement of the wrist or longitudinal compression exacerbates the pain. - Any metacarpal fracture angulation can produce a pseudo-claw deformity. We can distinguish different types of metacarpal fractures: base fractures, shaft fractures, neck and head fractures. These fractures can either be displaced (shifted) or non- displaced They all have a specific cause and clinical presentation. Globally these patients all report a snapping or popping sensation. Metacarpal Base Fractures: These fractures are intra-articular and result from high forces (violent accidents), direct blows, or crushing injuries that disrupt the rigid carpal ligaments, or overwhelm the normal flexibility of the ulnar metacarpals. They also occur with an avulsion of the wrist flexors or extensors, that insert on the metacarpal base, resulting from a direct blow or torsional injury. The most common occurrence is at the 5th metacarpal-hamate articulation. The healing rate varies from three to six weeks. Metacarpal Neck Fractures: Most common metacarpal fracture. The weakest point of the metacarpal bone is the extra-articular neck. These fractures result from a compression force such as a direct blow with a closed fist. 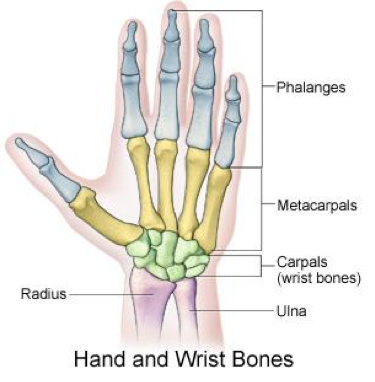 The 4th and 5th metacarpals are most often involved and are referred to as a “fighter’s” or “boxer’s” fracture. Trauma causes the fractured metacarpal head to displace with volar angulation. The healing rate is three to five weeks. - Physical examination of a suspected metacarpal fracture should concentrate on hand deformity, tenderness, digit mal rotation, and presence of open wounds. Painful range of motion, point specific bone tenderness and ecchymosis should be considered red flags for fractures. - Routine radiographs include three views: antero-posterior, lateral, and oblique. These views assist in properly assessing angulation of fracture fragments as well as involved joint surfaces. Computed Tomography scans, or CT scans, may be ordered to evaluate complicated fractures. - Ultrasonography: this type of diagnostic procedure is especially used in scaphoid fractures, as it’s only proven reliable and accurate for this specific type. - An MRI is almost never necessary for an isolated metacarpal fracture, as they normally don’t add any further information beyond a regular x-ray. But if other injuries are suspected, an MRI can be used as a supplementary test. -Disabilities of the Arm, Shoulder, and Hand score (QuickDASH): this questionnaire is scored in two components: the disability/symptom section (30 items, scored 1-5) and the optional high performance Sport/Music or Work section (4 items, scored 1-5). -Patient Evaluation Measure (PEM): this questionnaire is similar to the DASH score and assesses the hand function by asking questions about the patients pain, tenderness, swelling, wrist movement and grip strength. - The Patient Evaluation Measure uses visual analogue scales and has three parts: The first part seeks the patient’s opinion on the delivery of care. The second part is entitled ‘‘How your hand is now’’ (Hand Health Profile) and has ten questions concerning feeling, cold sensitivity, pain frequency, use for fiddly (fine dexterous) activities, movement, grip strength, activity, use for work, appearance and general attitude. The third part has three questions, which cover the overall assessment of outcome after the injury. - The HOSS is a doctor-administered form and combines both subjective and objective measures. The HOSS measures the injury in four tissues: integument, skeletal, motor and neural. These four tissues and their degree of impairment form the basis for measuring the outcome in the HOSS. 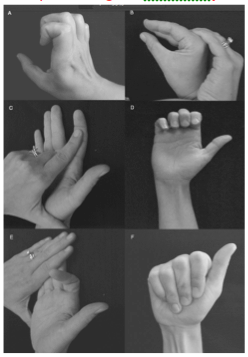 - Michigan Hand Outcome questionnaire: test-retest reliability was measured using Spearman's correlation and demonstrated substantial agreement, ranging from 0.81 for the aesthetics scale to 0.97 for the ADL scale. In testing for internal consistency, Cronbach's alphas ranged from 0.86 for the pain scale to 0.97 for the ADL scale. Correlation between scales gave evidence of construct validity. - CT-scan (computed tomography): it uses computer-processed X-rays to make tomographic images. It evaluate the metacarpal-carpal joints in complicated fractures. - MRI (magnetic resonance imaging): it is used to investigate the physiology and anatomy of the body. The above-mentioned techniques are rarely used in acute skeletal injuries of the hand. union, and early mobilization to minimize disability. Stable fractures will not lose approximation with muscle tension or controlled motion. Potential unstable fractures are those that are aligned, but may get misaligned with certain positions or tension. These are treated with immobilization that maintains reduction or restriction of motion towards position of instability. As healing occurs, immobilization can be modified to allow incremental increases in ROM. Two facts must be provided with therapy referral: date of fracture and method of fixation. Date of fracture provides a timetable on where the bone healing process is. Knowing the method of fixation will determine when motion can be introduced. Open reduction fixations (implementation of implants to guide the healing process of bone) can begin AROM (active range of motion) earlier. The evaluations of rotational malalignement and stability of these unstable fractures are the most critical elements to choose between operative and non-operative treatment. The latter is cheaper and avoids complications of surgical treatment. There is a chance that it may not restore skeletal position and maintain stability. Open surgery can accomplish the most stable anatomic reduction. Important to notice is that if there has been an aggressive surgeon’s intervention, a more aggressive post-operative rehabilitation is required. In recent literature, studies were executed to evaluate the outcome measures in patients with a metacarpal fracture, who received different medical treatments. Such as Giddins says “most hand fractures can be treated non-operatively”  (Giddins et al, level 2A), which accentuates the important role of the physical therapist in the healing process. But some hand fractures, such as open injuries or displaced intra-articular fractures, are almost always treated operatively. In this section, we will discuss de the modalities and role of the physical therapist after a metacarpal fracture. In early phases of therapy, patient should be educated on edema control. Rest, ice, compression, and elevation should be emphasized.The intervention of the physical therapist consist of applying powertraining modalities or guide the healing process by using a splint. Alongside of improving the functionality, active, passive and resistive exercises also affect the recovery process of bone and cartilage. Buddy strapping the injured digit to another digit is used as a non-operative technique. This is used with or without the application of varying degrees of splint. The ‘buddy’ reduces the risk of rotational deformity. The splinting of the fracture should be with an aim if 20 degrees wrist extension, the metacarpophalangeal joint in 60-70 degree flexion and interphalangeal joint extension  (HAUGHTON et al, Level of evidence 5). Tendon gliding is important to prevent adhesions,increased circulation about the fracture site, decreased edema and compression at the fracture site. FDP tendons and selected tendon glide should be performed by actively flexing the injured PIP joint while positioning the other DIP joints in extension. The EI and EDQ tendons should glide on the adjacent EDC tendon and the EDC tendons on the underlying bone. By extending the MPC joints while IP joints are flexed, tendon gliding of the EDC tendon should be performed. Once the therapist knows the location of the fracture, joint mobilization can be started. It is preferable to applicate arthrokinematic motion before traditional PROM. The force in physiological PROM is applied at a distance from the joint axis of motion, which can be produced extra load around the fracture site. For arthrokinematic motion, the force is directed perpendicular to the joint surface, which is not stressing the fracture site. The timing of initiation of joint mobilization depends on the structures involved in the injury. If the structures resisting the force are not involved in the injury, joint mobilization can be initiated at the same time as active motion. Compression on the fracture can result in shortening, angulation or rotational malalignment of the bone. Traditional PROM aims to assist in articular cartilage healing, reduce swelling and stiffness. Continuous passive motion (CPM) is a form of PROM. It applies force through the phalanx, thus applies a torque to the fracture site. CPM has the potential to decrease edema and improve synovial fluid production. CPM can be applied as soon as traditional PROM is allowed. However, Continuous passive motion can never replace active and resistive exercise and the application of CPM should not be painful. Four weeks after the injury light resistance can be performed in most metacarpal fractures which are treated by immobilization. Active motion should only be continued if healing has not started. Resistive exercise should also be delayed when a fracture is fixed by pinning until these pins are removed, to ensure stability of the fracture. Hardy MA. Principles of Metacarpal and Phalangeal Fracture Management: A Review of Rehabilitation Concepts. Journal of Orthopedic and Sports Physical Therapy. 2004; 34:781-791. A metacarpal fracture is a break in one of the five metacarpal bones of either hand. It is categorized as being head fractures, neck fractures, shaft fractures and base fractures. These fractures can either be displaced or non- displaced. The main cause of most metacarpal fractures of the fingers is a direct forceful blow on the fingers. Each fracture-type has specific clinical presentation. Medical treatment must not sacrifice the hand functions. The primary goals of medical management are to achieve anatomic and stable reduction, bony union, and early mobilization to minimize disability. Knowledge of the relevant anatomy, acting muscular forces and the mechanisms of fractures is required to choose the appropriate treatment. The intervention of the physical therapist consist of applying strength exercises or guide the healing process by using a splint. Alongside of the improved functionality, active, passive and resistive exercises also affect the recovery process. ↑ 6.0 6.1 6.2 J. J. de Jongel et al, Fractures of the metacarpals. A retrospective analysis of incidence and aetiology and a review of the English-language literature, ‘Department of Traumatology, and ‘Department of Plastic and Reconstructive Surgery, University Hospital Groningen, The Netherlands. Injury, 1994, Vol. 25, 365-369, August. ↑ 8.0 8.1 8.2 8.3 8.4 8.5 8.6 8.7 Michael DelCore ,Metacarpal fractures, orthopaedicsone ,2015. ↑ 10.0 10.1 10.2 Tiel-van Buul MM et al, The value of radiographs and bone scintigraphy in suspected scaphoid fracture. A statistical analysis. J Hand Surg [Br] 1993;18:403-6.